An “irreplaceable” iconic stone landmark that took 320 million years to form has been smashed in seconds by “idiot” youths. 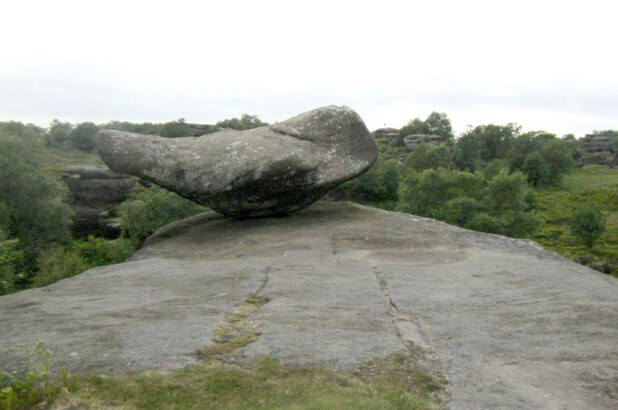 One of the balancing stones at the Brimham Rocks was sent toppling from its perch in what authorities have described as a “completely pointless” act by the thoughtless kids. North Yorkshire, two weeks ago — forever damaging the iconic landmark. The Brimham Rocks are about 215 miles north of London. Thousands of tourists flock to the stunning landmark every year to see the weird and wonderful shapes sculpted by wind and ice over millions of years. People have also carved their names into the sandstone — previously touched only by nature. People have been scrawling their names on the rocks for years. But the years of history that began before the first dinosaurs walked the Earth have been spoiled by the careless youths. Police have now warned that the actions have created a potential hazard for other visitors to the site. The damage caused by vandals at the Brimham Rocks. A North Yorkshire Police statement said they had received reports that five young people were seen pushing a rock from its perch about 8:45 p.m. Friday, June 1. They appealed for anyone with information to come forward. 0 Response to "Horrible kids destroy 320 million years of history in an instant"